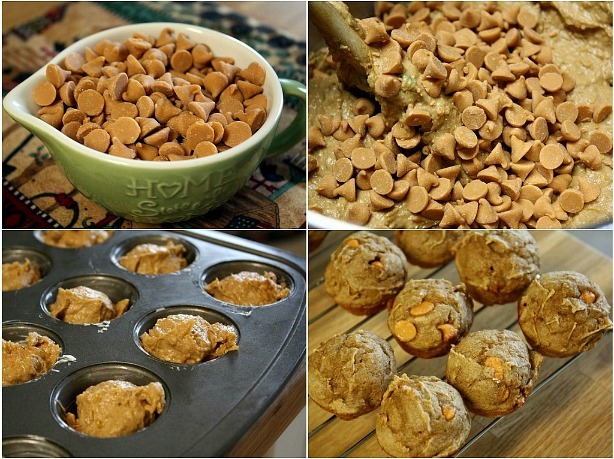 These four ingredient bite size butterscotch pumpkin muffins are made with a spice cake mix, fresh pumpkin puree and butterscotch chips. Happy Thursday friends!!!! It's a beautiful Fall morning here in North Texas. The cooler temps that blew in last night are a welcome relief to say the least. I know the actual Fall season is still far off for us Texans but it's mornings like these that assure me that Fall is just around the corner. As I sit and write this post I can feel the cool breeze blowing in through our windows. This beautiful breeze puts a smile on my face because these windows haven't been opened since Spring. It will be a bit before our leaves start to change in our treee's. Right now our trees looks like fall is about to approach, but I assure you friends they're just dried up from the Texas heat. I'm looking so forward to planting mums and pansies, but I will hold off a bit because I don't want to push my luck. Since were talking about Fall this morning let's talk about these cute little muffins pictured above. Yesterday was a hot one in deed, but it didn't stop me from baking these insanely scrumptious Butterscotch Pumpkin Muffins. Yesterday on face book I saw some pumpkin chocolate chip cookies that Holly from Life as a Lofthouse had made. My first intentions were to make cookies, but quickly changed into muffins. My muffin man Carson is a pumpkin lover for sure, so I thought I would surprise the kids with muffins instead. I also only had butterscotch chips, so I tossed those in the batter instead of chocolate chips. 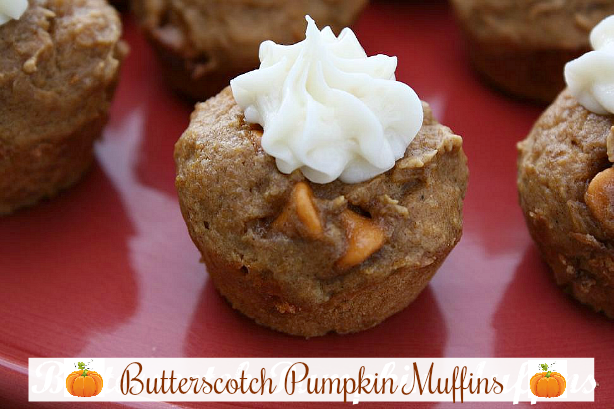 Pumpkin and butterscotch is a match made in heaven my friends. Trust me on this one. I didn't have any canned pumpkin, but I had plenty of fresh pumpkin puree that I had froze from last year. I have to say I liked the results so much better using fresh pumpkin insted of canned. Patience has never been my thing, so as soon as I pulled these muffins out of the oven I had to grab my first taste. Goodness gracious they were so soft and so good. The butterscotch chips complimented the pumpkin perfectly!!!!!! I planned on just eating them plain, but I couldn't resist slathering on a bit of cream cheese frosting on top of a few. If you want them low cal then don't do the frosting, but if not then I say go for it. Let the mini muffins completely cool before frosting. These are wonderful plain or with the cream cheese frosting.. The plain ones are diet friendly and perfect in the kids lunch boxes. Preheat oven to 350 degrees. Empty the cake mix into a large bowl. If it looks lumpy then sift the cake mix. Once sifted, add the pumpkin and the egg white. Mix to combine. Do not add required ingredients on the back of the box. Stir in the butterscotch chips and mix to combine. Spray a mini muffin pan with non stick baking spray. Using a cookie scoop drop the batter into each muffin cup. Keep in mind the way the batter looks in the pan is how your muffins will shape after baking. I smoothed mine a bit. Bake for 10 - 12 minutes. Remove from oven and let cool in the muffin pan for 5 minutes then remove to a plate. When completely cool frost with cream cheese frosting or eat plain. Using an electric mixer, mix the butter or margarine and cream cheese together, about 3 minutes on medium speed until very smooth. Scrape down the sides and bottom of the bowl to ensure even mixing. Add the vanilla extract and mix. Slowly add the powdered sugar; keep adding until you get the desired sweetness and thickness. If the mixture is too thick you can add a splash of milk. Using a star tip squeeze a bit of frosting on each muffin. Or eat plain. i too would like to know...do you make the cake mix recipe like it says on the box and then add the pumpkin, or just add the pumpkin to the dry mix? There are step by step photos and directions above. As well as in the recipe. It states to add the cake mix in the bowl and then add the pumpkin. Don't add any of the called for ingredients on the cake mix. Oh yum! I love just about anything made with pumpkin but I don't think I've ever tried pumpkin with butterscotch. These look and sound so good! I can't wait to give these a try. We are in for some cooler temps this weekend in North Carolina and I can't wait...so ready for fall! I have to admit I am jealous of your fall temps! You should probably send me some of these to make me feel better! These were very delicious Tina!! Your website is awesome!! Thank you and I am glad you got a chance to make them. @Leslie don't be too jealous. The cooler temps come and go quickly. We will be back in the 90's by the weekend. But anything is better than the 100's. 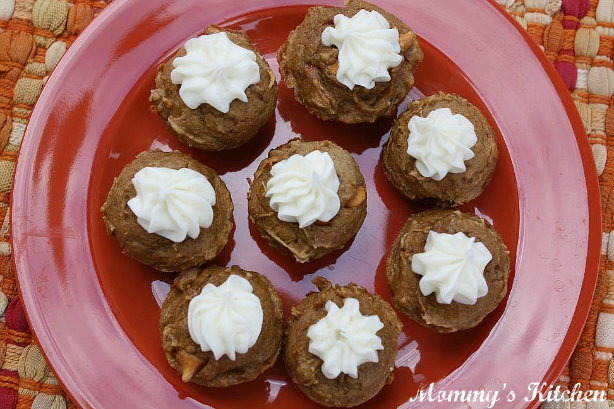 I made these with cinnamon chips just the other day and they are sooo yummy!!! Oh goodness I bet the cinnamon chip ones were so good. Great choice and thank you for coming back and commenting. There you have it another great chip choice. love these muffins. ran to the store and got the ingredients in my pjs. i have thoroughly enjoyed several of your dishes and the step by step photos! i post your blog on FB every time that I make one of your dishes! Hi Tina! I just took some of these yummy muffins out of the oven. The house smells amazing. They taste delicious. My daughter said they taste like an oatmeal scotchie muffin. For tonight, I'm going to leave them plain. May try a little frosting tomorrow on a few. Thanks so much for sharing this simple yet delicious recipe. Can't wait to try some of your others. Tina, for you to say I inspire you is the ultimate compliment! Thank you so much!! : ) And Im loving the idea of using cinnamon chips I read on other comments! Yum!! Picky-Picky Husband absolutely loves butterscotch, so these will go over BIG. We simply love muffins! Can't wait to try out your recipe. This sounds like such a fun fall recipe! 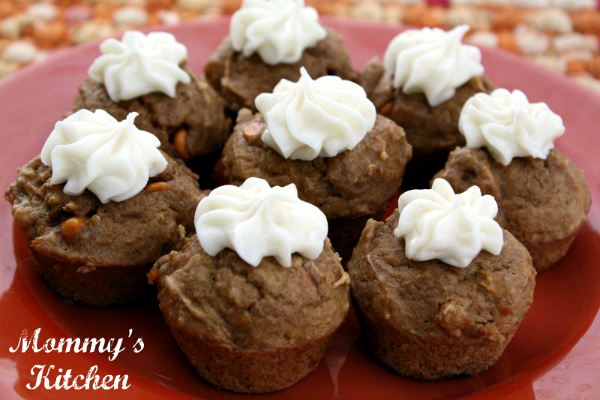 These look great - perfect for fall snacking! I'd like to invite you to share your recipe on Sweet Indulgences Sunday. These are in the oven now! My house smells so yummy! What I love best is that this recipe is easy to make and egg free.. That means my egg-allergic husband can enjoy them too! Can I make these as bigger, cupcake-sized muffins? I add about 1/3 to 1/2 cup egg white to mine and then they rise and fluff up just a bit. Hi Tina! I have been a fan for a long time! I love your blog. Can you tell me how to pin from this link? Thanks!